It took me a long time to realize and accept that I'm a writer. I thought that I needed to contribute an article for a notable magazine or website or sign a book contract in order to do that, but that is simply not the case. I'm pleased that some of those things have happened in recent years, but for a very long time I operated under some false assumptions that you can only consider yourself a writer if you achieve some measure of success. Simply put, writers write. 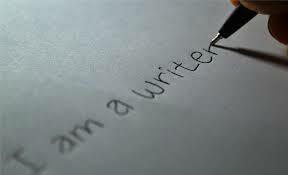 If you write something, you're a writer. And some writers want to write things that reach a wider audience, whether through a personal blog, periodical, or book. That takes a little more effort and discipline. It's not impossible, but it does call for intentionality. So a writer who wants to set some higher goals will need to buckle down in order to pursue them. I'm far from an authority on what works, as I'm still discovering that myself. But here are five things that I've found helpful to do in order to improve my writing while striving for larger platforms. 1. Sit down and write. It seems like such a no-brainer, doesn't it? And yet for a very long time I thought and talked and talked and thought about being a writer; going after those magazines and books and whatever else. But there was one problem: I didn't actually sit at my computer to draft inquiries and proposals, let alone an actual manuscript of any kind. Thinking and talking about it was the easy part. Now, sure, it may be that when you do make it a point to sit down and open the laptop, you'll still end up staring at a blinking cursor on a blank page. But hey, that's still progress! You've taken a step! Hooray! At this point, it may be beneficial to just start typing and see what happens. This will help get you into Writing Mode, and develop a habitual ease with moving beyond talk and getting to work. When it comes down to it, the only way you're going to write something is if you actually write something. Again, this seems so simple, but it can take quite a bit of self-starting. 2. Carve out the time. Closely related to sitting down to write is to make time to do so. I can't recall just how often I've said to myself, "I'd love to write, but I have so many other things to do." I have a wife, two kids, a career, I try to maintain a workout routine, and I have several other obligations. It's natural to look at all that and think that there will never be any time to write anything. To be honest, this will take creativity and, no surprise, intentionality. Carving out the time to write will mean sacrificing something else. It may involve setting the alarm earlier or staying up later than the rest of your household. It may involve hiding in another room of the house away from the family for a while. It may involve giving less attention to another hobby or interest. If you want to sit down and write, you have to make the time to do it. 3. Outline, outline, outline. Okay. You're sitting at your desk after canceling your Saturday tee time or after everyone else has gone to bed. And that blinking cursor is still taunting you, daring you to make it do something. You've accepted its challenge, and you've got some ideas forming. But how do you flesh those out into an 800-1000 word essay or a 4000-5000 word book chapter, let alone many essays or chapters? My solution has been to outline what I'm going to do, and how I'm going to do it. First, list off the main ideas that you want to include and see how they fit together. What makes sense to come first, then second, and so on? Then return to each main point and figure out what information or illustrations might be helpful in developing them. Again, this will help you discern how the main points fit together. You can see whether the story you tell at the end of Point One helps segue into the start of Point Two, whether you'd be better off moving Point Three to the top, and so on. 4. Take breaks. An otherwise busy person may treasure the time he or she has set aside to write, and may feel an obligation to produce something during those sessions. But there also come times when, if you've been at it long enough in one sitting, your brain might start to feel a bit crunchy and the quality of your work is going to suffer. While I'd argue that you have to give yourself a significant stretch to get the muse rolling during a writing session, there also comes a point where you might want to step away instead of willing yourself forward. Sometimes, this may just be a few minutes. Stand up and stretch, go get a cup of coffee, walk around the house for a bit, and then get back to it. Other times, you may just find that you've hit a good stopping point and it's better to recharge than to force yourself to continue. No matter our work, being able to rest is what helps us return and keep working at a productive level. This includes the work of writing. 5. Treat yourself. I've found that having something to look forward to is helpful to my own writing process. Whether I'm working with a deadline or just want to be able to get something done, I like having a carrot dangling at the finish line. At times this has been giving myself permission to order a new book or album, at others it's been ice cream. You know what your favorite (legal, healthy) indulgences are, so make a deal with yourself that once you finish a writing project, you can enjoy it. Even name the specific thing that you'll go after, e.g., "Once I turn in this essay I'm going to download the new Dead Weather album," or "I won't head out to see this movie until I finish this chapter draft." This is different for everyone, but giving yourself positive reinforcement; knowing what awaits you when you hit your latest goal, can help you stay motivated and focused on the task at hand. There are plenty more writing tips out there, and I haven't really covered any new ground. But these are at the top of my own list. I'm also not an expert. I just figured out what works best for me. So take what's helpful for you and add your own. Have at it, fellow writers.